Details Our French natural yellow iron oxide is from ocher deposits in the French quarries of Gargas and Rustrel nestled in a 12 mile long enclave in the heart of the Luberon Massif, the ocher country. It is a pigment of outstanding chemical stability and weather resistance. It is has low tinting strength, but is more opaque than yellow or gold ocher and has good covering power. Mars yellow is the name given to the artificial substitute of natural yellow oxide. Known since antiquity, yellow oxide occurs naturally as yellow ocher (limonite) or as red ocher (hematite). It has been used as a pigment since prehistoric times and is perhaps the most widely used pigment for artists' paints. The composition of natural yellow oxide depends on the source, which is usually South Africa, India, France, Italy, Russia, and the United States. The best and most carefully washed and refined grades, according to Ralph Mayer, come from France [The Artist's Handbook, p. 214]. Widely called yellow ocher or yellow earth, it is a clay colored by iron and produced in a number of yellow shades. 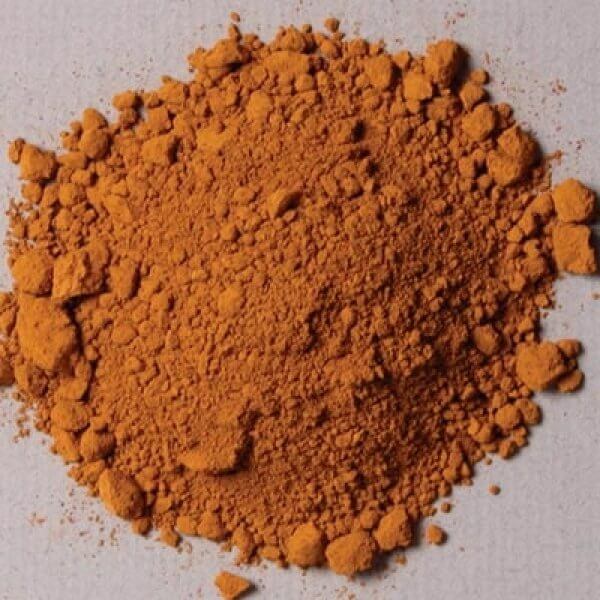 Ocher is a natural earth composed of the natural mineral goethite, and traces of other minerals. Historically, yellow ocher was designated by the mineral name limonite. Limonite, however, is not a true mineral, but a general term used to describe all forms of hydrated iron oxide minerals (α-FeOOH) that occur as natural earth. Limonite includes the minerals goethite, akaganeite and lepidocrocite. The higher iron content, larger particles sizes can give darker, more opaque colors. Like red iron oxides (hematite), they are found around the world and have been used as pigments since prehistory. Natural yellow oxide is among the most permanent colors among the artist's palette. It is compatible with all other pigments, and can be used with good results in all mediums. Natural yellow oxide absorbs a moderately high amount of oil. The oil absorption ratio is 30�35 parts by weight of linseed oil to 100 parts by weight of pigment. If the measurement were grams, the pigment would require 30�35 grams of linseed oil to grind 100 grams of pigment to form a stiff paste. It is average to slow as an oil paint, but forms a tough, flexible film. Natural yellow oxide is not considered toxic, but care should be used in handling the dry powder pigment to avoid inhaling the dust.